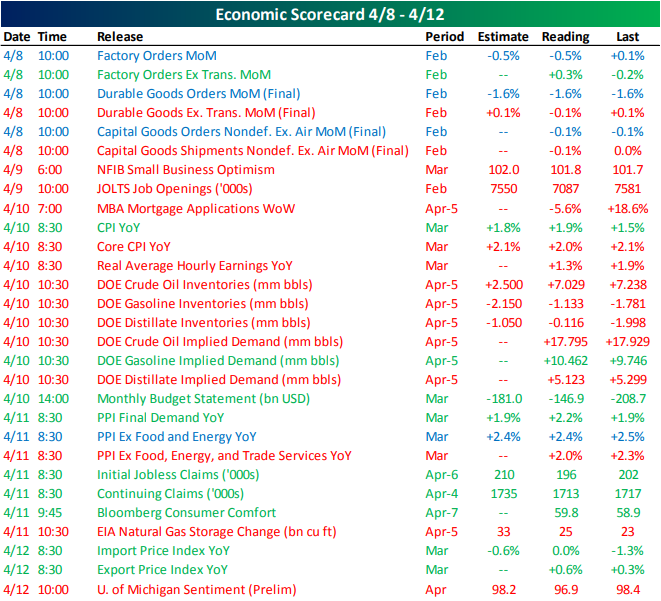 Last week was mixed in economic data with some bias towards weaker data points. Factory orders kicked off the week showing a decline inline with expectations. Durable goods and capital goods similarly came in with declines across the board. Tuesday saw misses in both NFIB Small Business Optimism and the JOLTS report while MBA mortgage applications also declined after a couple of strong weeks in a row. Wednesday’s headline CPI beat estimates, but the core measure which controls for volatility in prices like oil, missed forecasts by 0.1%. PPI inflation came in later in the week with a beat in the headline number, but a decline from the previous period in both core measures. Staying on the topic of oil, EIA data on Wednesday showed a second week of crude inventory builds over 7 mm bls, but also showed strong gasoline demand and inventory draws. Preliminary readings for April University of Michigan Sentiment capped off the week with a decline to 96.9 versus the forecasted drop of only 0.2. It’s going to be a pretty boring start to the week with Empire Manufacturing and Treasury flows the only releases to note today. Empire Manufacturing came in above estimates at 10.1 earlier this morning. That is also handily above the March print. 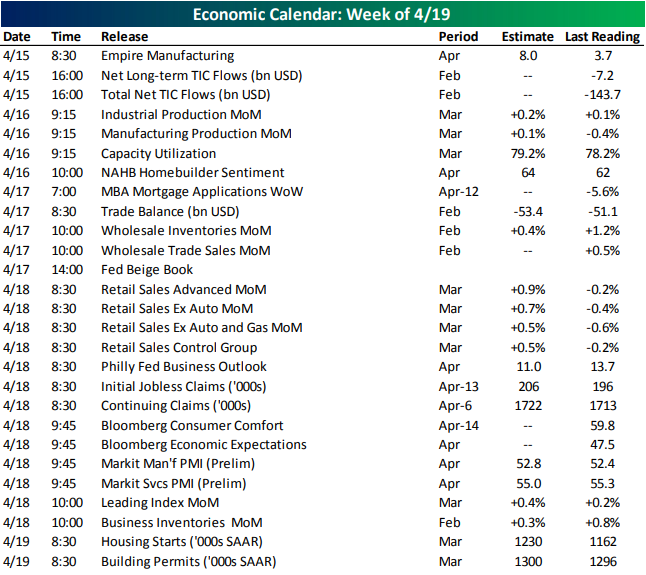 More manufacturing data will be released tomorrow with Industrial and Manufacturing Production for March. Homebuilder sentiment for April will also be out Tuesday, expecting to rise to 64 from 62 in March. The Trade Balance for February will come out on Wednesday along with the Fed’s Beige Book later on in the afternoon. Thursday will be a particularly busy day with 13 releases scattered throughout the morning. We will hopefully get a better picture on retail sales which has been very volatile this year with March data coming out Tuesday. Month-over-month increases are expected across the board. In manufacturing data, Philly Fed Outlook will be out alongside the Market Flash PMIs for April. The service counterpart will also be released. While markets will be closed for Good Friday, the Federal Government will still be open and releasing data as we will get Housing Starts and Permits. Both are forecasted to show improvements from the February prints. Use our Economic Monitorsto stay up to date on daily economic releases.